It sounds like Roger & Millie Medby have been over served. They're into their third sale, and still have a houseful of stock from Hollyhock antiques. Where did they get all this stuff. Anyway, Millie has slashed the prices again, and the third time around might just be the best. So, grab a box, or better yet a pickup, and head up to Midway to help Millie clean out the house. The sale is this Thursday, Friday and Saturday (March 29-30-31) at the house behind Fillerup Coffee Station, 30 North 200 East in Midway. If you want to be the guy who knows everything, amaze your friends with your command of the antiques scene, and be a role model to your children, then you're in the right place. Here it is, in all it's glory. 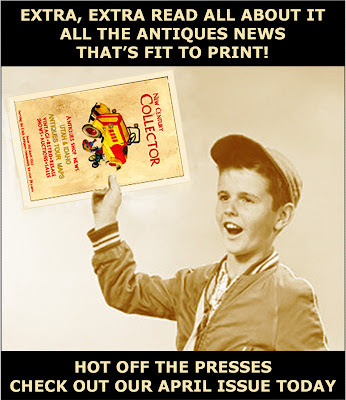 The April issue of the New Century Collector. We've got it, all the antiques news that's fit to print. So, show your friends your savoir faire. Just click on the link below, and you'll be on your way to putting a little style in your life. 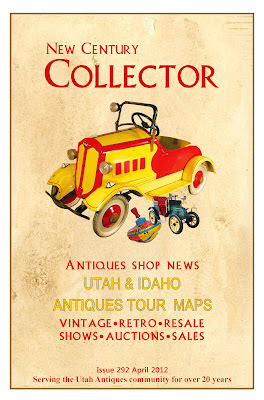 I’ve been fielding calls lately, from collectors wondering about the dates for the Walter Larsen Spring Show. Well, for those who haven’t heard the news, the Larson show has been sold to Denver promoter Nancy Johnson, who has not scheduled a show until fall 2012. 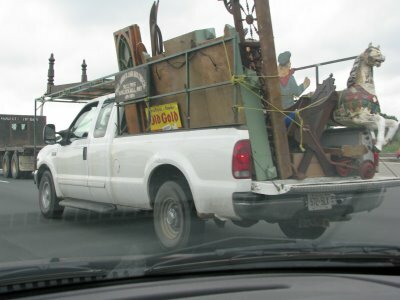 Not to worry, because the Larson show isn’t the only place to get your springtime antiques fix. 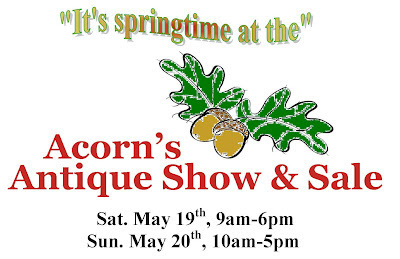 Just jump in your jalopy, and head a few miles north to the Weber County Fairgrounds, where on May 19th & 20th you’ll find an antiques wonderland, courtesy of Heidi Wilcock who promotes the Acorns antiques show. 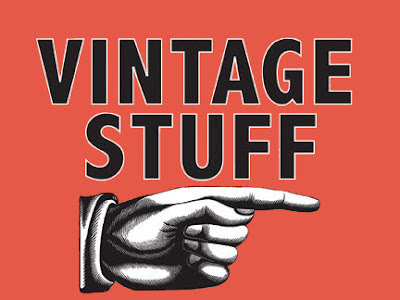 This is a great show that should be on any serious antiquers list of to do’s. OUR FAVORITE WORDS, "ANTIQUES SALE"
I have to confess, that every time I hear the word antiques, my interest piques just a little bit. However, pair it with the word sale, and I become intently interested. The only thing that can moderate my enthusiasm is if Lyn sees the sign, and begins to eye my wallet. 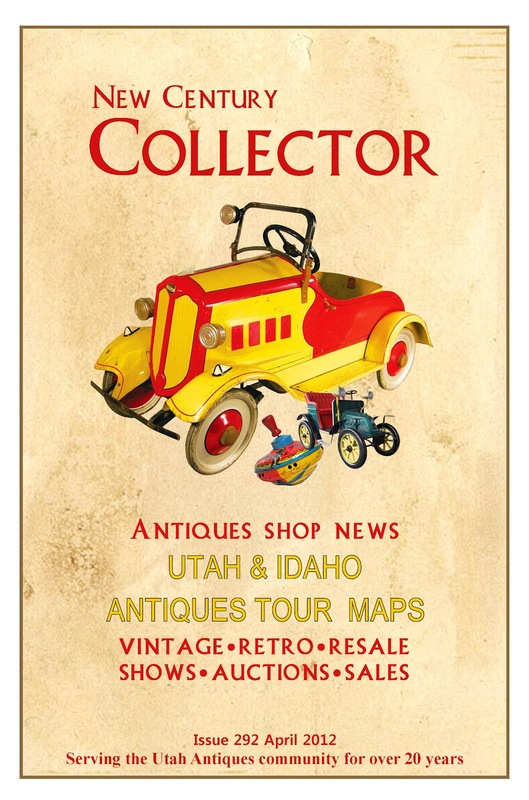 More to the point, Millie and Roger Medby will be liquidating the contents of Hollyhock, their Midway Utah antiques shop, on the 15th, 16th & 17th of March. The sale will be held daily from 9 to 3, in an old brick house behind "Fillerup Coffee Station", at 30 No. 200 E. There should be plenty of great stuff to sate your antiques appetite. I didn't tell Lyn about this one, tomorrow's her birthday, so I'll sneak up to Midway and try to find a hallowed object or two. Everyone need a little help on the road to nirvana. See you there.